From the Old World to the New, mythologies of origins typically portray the emergence of agriculture as a gift or blessing from benevolent gods, seemingly with one exception. For the Sumerians of the Old World, the earth was barren at first, with humans living in the wilderness foraging for plants, but, signaling civilization’s dawn, well-meaning gods gave plant and animal agriculture to humankind for sustenance. In the New World’s Mesoamerican civilization, Quetzalcoatl — a feathered serpent-god, but sometimes a half-god, half-historical human — gave arts, knowledge, and agriculture to humankind so that humans could leave behind their savage, hunting-gathering ways. Similar mythologies of origins are common among other ancient peoples around the world. In the Judeo-Christian mythology of western civilization, however, godly retribution for eating the fruit from the tree of knowledge of good and evil led to Adam and Eve’s inevitable adoption of farming when they were banished from paradise: “Cursed is the ground because of you! In toil, you shall eat its yield all the days of your life. (…) By the sweat of your brow, you shall eat bread… .” A partial interpretation of the Judeo-Christian story of agricultural origins is that, compared to our prior condition, procuring sustenance through farming implies substantially altering nature through hard work. We believe that producing food as we have, especially during the last ~100 years, puts us markedly at odds with nature’s forces, specifically with the ecological and evolutionary forces that underpin nature’s workings. As plants, crops are subject to “rules” set by those ecological and evolutionary forces, and the same applies to all crop associates, such as herbivores and pathogens, and pests and disease organisms. Indeed, a growing body of literature points to the many contradictions between modern agriculture — broadly — on one hand, and ecological and evolutionary rules on the other hand, and to the resulting, unfortunate outcomes. Our own research in pest management, as well as that of others, revealed examples of how from the dawn of agriculture to the present, we created pests from herbivores by ignoring those rules — unknowingly at first, and presently with eyes wide open — in our efforts to produce food to satisfy our demands. Some of the insect pests that we have studied illustrate how since agriculture’s emergence, evolutionary, ecological, and agricultural processes, from domestication and spread of crops to herbivore host-plant shifts and agricultural intensification, among others, were conducive to transforming some herbivores into crop pests. Such herbivores, we believe, likely were the most-pertinently pre-adapted — as whole species or particular populations of a species — among the herbivores living on (i.e. hosted by) crop wild relatives or associates. We believe, too, that by looking in the past and around us, while armed with modern ecological, evolutionary and genetic insights and tools, we should be able to preempt pests that emerge as agriculture adapts to ongoing climate change. One of the insect pests that we have studied is corn leafhopper (Dalbulus maidis), the most important sap-sucking (i.e. phloem-feeding) pest of maize (Zea mays mays) in the Neotropics, particularly from Mexico to Argentina and the Caribbean. The corn leafhopper’s native range is in western Mexico, and its ancestral — or original — host plant is Balsas teosinte (Zea mays parviglumis), maize’s immediate ancestor. Maize was domesticated beginning ~9000 years ago within the corn leafhopper’s native range and is the domesticated form of Balsas teosinte. So, as Balsas teosinte was being transformed into maize by ancient Mexicans — a process that required some 5,000 years — it was a predictably easy feat for corn leafhopper to add the new crop to its short list of host plants, which consists exclusively of grasses in the genus Zea, namely a handful of teosintes and maize. Of the world’s crops, maize is probably the most adaptable to novel environments, a trait that allowed it to spread quickly and widely in the Americas — from today’s southern Canada to Peru and Argentina, and the Caribbean, and from sea level to 4,000 m — before spreading worldwide. Where maize spread in the Americas it was followed by corn leafhopper — except to the crop’s southern- and northernmost distributional limits, where winters are too cold for the insect’s survival. And, as maize was made more productive and maize farming was intensified, the corn leafhopper became a pest. But, how did corn leafhopper become a pest, given its background as an innocuous herbivore on a wild grass? Dr. Lowell “Skip” Nault — currently Professor Emeritus at The Ohio State University — was the first to begin addressing this broad question. For instance, after numerous studies over decades, he and his students and associates uncovered clear evidence that corn leafhopper indeed co-evolved with maize since its domestication, and that a small set of biological particularities facilitated the herbivore’s transmutation to a pest. For instance, Nault and his team showed that corn leafhopper was unlike the several other species of Dalbulus leafhoppers on Balsas teosinte and related grasses — ordinary herbivores all — in that it reproduces exclusively on Zea grasses, and overwinters in adult rather than egg stage. Compared to its Dalbulus congeners — all early candidates for occupying maize’s “sap-sucking insect niche” and becoming pests — being a specialist on Zea likely meant that corn leafhopper was near-flawlessly adapted to exploiting maize as it was being tamed into becoming a crop. And, compared too with its Dalbulus congeners, overwintering in the adult stage meant that corn leafhopper would be the first to colonize maize plants as they germinated following the first, early-summer rains. More recently, our own research added further detail to the story — similar to an impressionist allegory, compiled over decades of research by numerous scientists — of corn leafhopper’s genesis to a maize pest. For instance, we found that corn leafhopper is not a monolithically pestiferous species, but seemingly is divided into two discrete populations, at the least. On one hand, there is a small isolated population of ordinary herbivore individuals living on an equally isolated, near-extinct wild host, perennial teosinte (Zea diploperennis), and, on the other hand, there is a much larger, widespread population of pestiferous individuals living on maize and teosintes everywhere else. Akin to a minute island floating in a vast ocean, corn leafhopper thus seems to consist of a minuscule and isolated population of “wild” individuals embedded within the geography occupied by a large and widespread population of “pestiferous” individuals. We found too, that if given access, wild corn leafhoppers thrive on maize, as expected if they are to become pests. In this way, it seems plausible that the wild corn leafhoppers may be the remnants of what corn leafhopper was before Quetzacoatl’s bestowal or Adam and Eve’s eviction from paradise. Separately, our research showed also that in transforming Balsas teosinte into maize and improving the crop to produce more grain, ancient farmers and modern crop breeders disarmed today’s maize varieties of their defenses against corn leafhopper, consistent with ecological theory positing that plants can reproduce well or defend well, but cannot simultaneously do both. In an agricultural context, that ecological theory usually means that crops can produce high yields or defend strongly against pests, but cannot do both. Altogether, Nault’s and our research suggest that in “inventing” — or receiving? — maize and maize agriculture, the New World’s first-farmers, along with their descendants and modern breeders provided an opportunity for a geographically restricted, ordinary herbivore hosted by the ordinary ancestor of a fundamental crop — a pest in-waiting, as it were — to become an important, widespread pest. 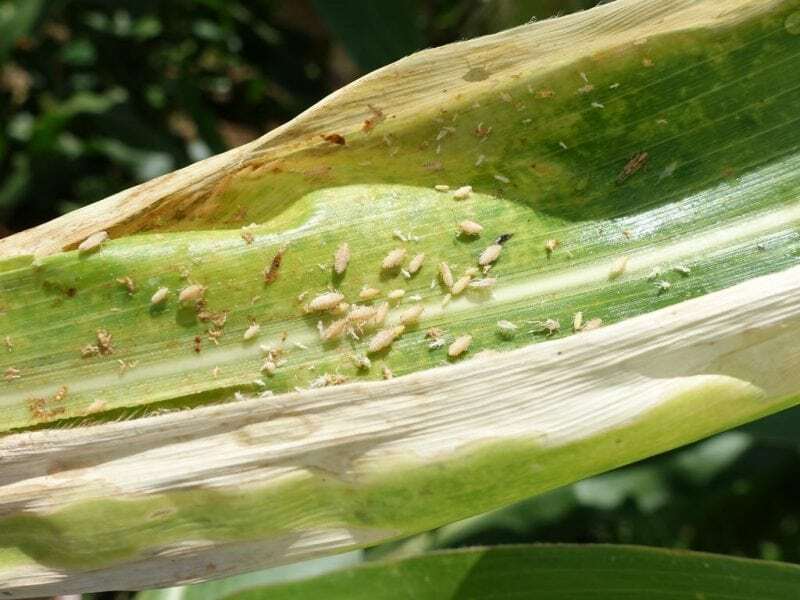 We are reminded by the small population of wild corn leafhoppers on perennial teosinte that pests are simply herbivores that took advantage of opportunities offered them by agriculture, just as any other herbivore would take an opportunity to do better by itself and its offspring. Other pest subjects of our research show similar origins. Western corn rootworm (Diabrotica virgifera virgifera), like corn leafhopper, is a maize pest that shifted to maize from one of the crop’s wild relatives— plausibly Chalco teosinte, Zea mays mexicana—and spread and became a pest as maize agriculture was intensified. Unlike corn leafhopper, however, western corn rootworm is the hands-down, single most-important pest of maize in the USA. Also unlike corn leafhopper, western corn rootworm seems to have become a pest coincident with the advent of modern, intensive agriculture, circa the mid-1900s. Our research suggests that with domestication and improvement, maize was disarmed of rootworm defenses— just as it was disarmed of corn leafhopper defenses— though this was evident only through the twentieth century’s first half. However, as maize was being disarmed, it seemingly was gaining tolerance. Tolerance is a defensive strategy that plants may deploy against herbivores, and in which plants are able to compensate (i.e. recover) growth and reproduction (seed production) lost to herbivores, and in not impacting herbivores IT does not elicit in them an evolutionary counter-response — i.e. herbivores do not respond by overcoming plant tolerance. During the second half of the twentieth century, and coincident with the advent of modern breeding for yield and insect resistance, intensified use of fertilizers and pesticides — including those targeting western corn rootworm — and western corn rootworm’s ascent to pest status, maize seems to have gained in resistance but lost tolerance against the pest. As a result, today maize seems to be modestly resistant and modestly tolerant to WCR, in other words, it is mostly susceptible to western corn rootworm, and therefore dependent on us for its defense. From our vantage point, it appears that in striving to make maize the most productive among crops — as it indeed is — we traded a plant-based, sustainable corn rootworm defense, tolerance, for human-based defense based on an arsenal of technologies that are poor matches for the insect’s evolutionary potential for adapting to environmental stresses. Our research continues seeking to better understand how pests come to be, and it includes other pests of New World crops, such as cotton fleahopper, a pest of US cotton, and fall armyworm, a widespread pest of maize. We return to a metaphor used above to point out that our understanding of how natural processes operate, from how a single individual may respond to an environmental stress to the evolution of complex traits in species, can be likened to an impressionist allegory. Impressionist artists — unlike realists, who emphasized truth — composed seemingly unfinished paintings lacking clarity of form and detail, recognizing that the absence of form and detail would be filled by our experiences. Likewise, with our research findings we may assemble descriptions about our subjects of study that contain knowledge gaps, but which may be enhanced with theory and observations to form discernible images, i.e. allegories, of how our subjects come to be or operate. We end by returning to the question of agricultural origins according to the world’s mythologies. From our pest management perspective, it seems tempting to align with the minority portrayal of agriculture’s birth as retribution rather than a blessing, and consider whether the seeds of today’s pests were sown when agriculture was invented. These findings are described in the article entitled, Agriculture sows pests: how crop domestication, host shifts, and agricultural intensification can create insect pests from herbivores, recently published in the journal Current Opinion in Insect Science. This work was conducted by Julio S Bernal and Raul F Medina from Texas A&M University. My research program focuses on two areas. 1) Contributing to the theory and practice of biological control of arthropod pests in managed ecosystems. Specifically, research has focused on ecology and behavior of natural enemies and pests via field and laboratory studies. And, 2) adding to our understanding of plant-defense evolution broadly and pest emergence associated with agricultural evolution, from crop domestication to changes in crop production practices. Teaching responsibilities include classroom teaching and graduate student training. Current classroom teaching activities include Principles of Biological Control (ENTO 608), Host Plant Resistance (ENTO 610; team-taught with Soil and Crop Sciences and Plant Pathology departments), and General Entomology (ENTO 201). Courses taught previously include: Biology of Insects ENTO 313, Principles of Insect Pest Management ENTO 401, and Seminar in Entomology ENTO 681 (spring 2002).